- Display: Large 1999 counts LCD display with function of Lux , x10 Lux, ºC, ºF, %RH and dB, A & dB , C & dB, Lo & dB, Hi & dB, MAX HOLD, DATA HOLD indication. - Polarity:< 80% Automatic, (-) negative polarity indication. - Over-range: "OL" mark indication. Manufacturer of technically advanced Portable Meters including Multimeters, Clamp Meters, Electrical Testers, and Environmental Meters for the measurement of Light, Sound, Temperature, Humidity, Airflow, RPMs, and Water Quality. 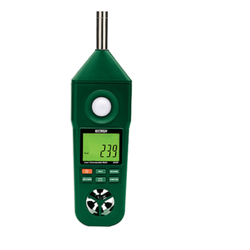 - Sound level meter: 30 to 130 dB, auto range. - Humidity: 10 to 95 %RH, Temp.. (oC/oF). - Anemometer: 0.4 to 30 m/s, Temp.. (oC/oF). Bright Medi-Weld Appliances excels in rendering a qualitative range of Lutron products, which is offered to the clients at leading market prices. - 4 in 1 : Humidity meter, Light meter, Anemometer, Type K/J thermometer. - Humidity : 10 to 95 %RH, 0 to 50 °C. - Light : 0 to 20, 000 Lux. - Anemometer : 0.4 to 25 m/s. *Temperature (F or C), Humidity.